Greetings from San Diego, where we're driving around in a surprisingly nice Ford Fusion. The Ford Fusion runs really quietly, has leather seats, and even comes with a V-6. But that's not the car that inspired this post. The car in question was some sort of Pontiac. When Avis dropped us off at our car (no going to the counter for me! ), I went to the driver's side to locate the trunk release. I noticed a rather significant scratch running along most of the length of the car. My first thought was to make sure the damage was noted on the rental agreement. My second thought was, "Hey, that's a word..." The F-word, in fact. We scooted to the counter and indicated that I wasn't looking to make quite so bold of a statement when I showed up for the meetings tomorrow. The counter guy was very shocked and expressed his opinion that people who damage cars should be treated like horse thieves. OK. Anyway, I have no complaints with the car we ended up with. In past years, I've gotten a convertible, but it's a little cold for it this time of year. The sun roof does just as well. It's been almost two years since I gave an NTN update. Last time I checked, I was at #18 on the Santa Fe Cafe's National Trivia Network rankings. Now I'm up to #17, but it's not through playing a lot. More likely, someone ahead of me switched to another location. I played for the first time in a while last Sunday at Joe Senser's in Bloomington. I did pretty well, even making it into that site's top 10 for the month. I've turned off comments on this blog. I set them up a year and a half ago and only received a handful -- mostly spam or anonymous obnoxious comments. I set the comments as moderated to discourage the latter, but recently I have received no comments. It clutters up the look of the blog a little bit, so bye-bye comments. In general, if you have anything to say to me, feel free to e-mail me. I'm happy to post feedback, but it appears to be an unusual enough event to merit perhaps its own post. I promised last month to share my pictures from Mahabalipuram in India. Here ya go. The first picture is from a set of monuments known as "Five Rathas". It was worth the price of admission ($5 for foreigners) to get away from the very agressive vendors trying to sell stone carvings, postcards and copies of the Kama Sutra ("very wicky-wicky", one assured me). The second set of monuments we saw was the "Shore Temple". I especially liked this one for its setting on the Indian Ocean. The final set included the "Descent of the Ganges", which is apparently the world's largest bas-relief. Like all of these stone carvings, it dates from approximately the seventh century AD. Near the Descent of the Ganges is a rock known as "Butterball." It was placed there by Krishna as a prank. When I last checked in with my Nebula-reading project, I had read 22 out of 41 novels. On our recent trip to Arizona, I read 2 more. This first book in the Heechee series is one of the best that I've read recently. The structure of the book alternates between chapters in which the protagonist, older, looks back on his adventures in conversations with a robot psychiatrist and chapters in which he recounts the adventures themselves. Hmm, which chapters do you think work better? 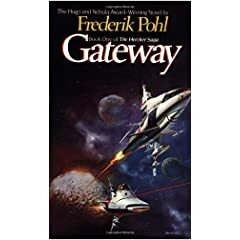 Where Pohl shines in this novel is the unique world he has created. In the next century or two, humankind has discovered the remains of an ancient civilization -- the Heechee. Furthermore, we have discovered their interstellar, faster-than-light spaceships -- but we don't really know how to steer them. So "prospectors" go out on missions to unknown, and likely deadly, destinations in search of Heechee technology. 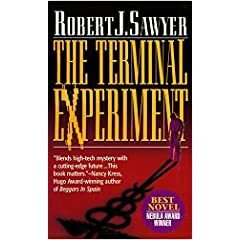 Reading Robert J. Sawyer's other work helped convince me of problems with the Hugo process. Since I was happier with the Nebulas I was surprised to see one of his novels on this list. I will give the Nebulas this -- they gave the award to a 2-star book rather than a 1-star one. But, man, this guy can't write as well as he thinks he can. "Pseudo was about fifty, and as slim as the Leafs' chances in the Stanley Cup." 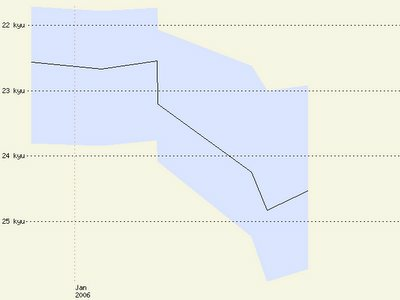 After a shaky start, my December go experience turned out rather well. I finished 18 more games in the rest of December -- I'll skip the game-by-game recap. I was 14-4, although two of the wins were in unrated games and two were in games that didn't count because the opponent never showed back up after the first 4 stones were placed. So 10-4 in rated games was enough to send me briefly to the heights of 22 kyu. I am, however, 2-4 in 2006, with all the games rated. These losses included three that should have been close to even for a 25kyu player. As a result, I'm now hanging on the upper edges of 25 kyu myself. I brought some go books out here to Arizona to read on vacation, but I've mostly been sticking with science fiction so far. I guess if I want to get back to 22 kyu, I should probably crack the books open. My first thought when writing about Wikipedia and the whole wiki phenomenon was to make a reference to the Will Smith version of the song "Wild Wild West", in which he repeats something which sounds a lot like "Wiki Wiki Wild." However, googling "Wiki Wiki Wild" shows me quite a number of people have thought of that reference before. Instead, I went for the obscure. Learning that wiki comes from the Hawaiian word for "quick", I thought of a sign I had seen on my ride from the Chennai airport to my hotel. Hurry, quick, same thing -- right? I only needed a food word to rhyme with wiki. After a while, I came up with tzatziki. See -- this blogging thing isn't as easy as you might think. Anyway, I've recently become interested in the 'wiki' phenomenon. For those of you not familiar with it, the basic idea is a web site that anybody can edit. The most well-known one is Wikipedia, which is an on-line encyclopedia. There are other, similar, sites, such as Wikinews. The one that intrigues me the most is Wikitravel. I love travel guidebooks, but I think there's a lot to be said for the energy of web surfers in keeping things up-to-date and in detailing obscure locations. The main beef I have with the wiki sites is that anybody can edit it. You don't generally even need an account. So if you visited the site between 6:17 and 6:19 PM on January 3rd, you saw this version of the page, which proclaimed, "He is a complete asshat." The fact that a quick-reacting wikipedian reverted to a previous version in 2 minutes is good evidence for why Wikipedia works better than I thought it would. On the other hand, contributing to Wikipedia seems to involve a lot of patrolling for vandalism. Because I want to learn about this new "technology", I've been playing around with Wikipedia and Wikitravel. I think the latter will hold my interest more in the long term. I have had some fun updating Wikipedia's Redskins pages, but I am not too interested in disputes about whether or not "Coach Janky Spanky" is "encycolopedic". 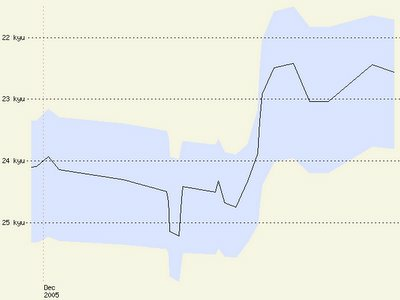 I'm going to try adding my 2006 travel experiences to Wikitravel. For example, last night we went to Nonna Maria's Pizza for dinner to celebrate my mother's birthday, and I added that restaurant to the skeletal Arizona page. Eventually, there may be a more specific page to move that to. I'll probably have more to say about the wiki phenomenon in coming weeks. An organization called "The New 7 Wonders Foundation" has produced a "short list" of 21 candidates for a new list of seven wonders of the world. They're taking votes this year, and will announce the winners on January 1, 1997. From that list, here are my seven choices. I'm not wedded to these, but I gave it a little bit of thought. I tried to stay away from ruins that are mostly interesting just because they're "ruins." Still, four of these sites are ruins. Stonehenge looks back to some of the earliest civilization. The Pyramids are a classic...I figure if you can survive from the original list, you deserve to stay on. The Colosseum and the Great Wall serve as representatives of two of the great civilizations of ancient times. In more modern times, the Taj Mahal is a stunning piece of architecture that combines Muslim and Hindu influences. Finally, the Statue of Liberty and Christ Redeemer capture what we do these days: build really big things to represent ideas -- in this case, freedom and religion, two ideas that have been at the center of human thought the past few decades. What are your top 7? Feel free to comment below. And I feel compelled to mention I've only seen 4 of the 21 candidates, which probably does not leave me 100% qualified to judge. If you don't have anything to blog about, link to somebody else's blog. More tips as events warrant.